Home Riding Apparel & Gear GWE Scratch Minimizing Helmet SprayReturn to Previous Page. Categories: Featured & New Arrivals | Green With Envy (GWE) | Helmets & Safety Equipment | Other Necessities | Riding Accessories | Riding Apparel & Gear. Tags: Exterior Helmet Spray | Green With Envy | GWE | Helmet Cleaner | helmet spray | Scratch Minimizing Helmet Spray. Directions for Use: Spray directly onto outer shell of helmet. Rub product in a circular motion until no streaks remain. Dries immediately. Many cleaning & deodorizing sprays claim to trap odors on contact, then magically make them disappear. While this sounds good in theory, the sprays that accomplish this do so through the use of countless harsh chemicals. 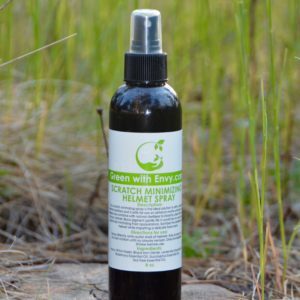 In one common name brand cleaning & deodorizing spray, the Environmental Working Group found a whopping 87 chemicals, yet only 3 ingredients were even disclosed on the label! Some of the chemicals found in that brand and other similar sprays included BHT, acetaldehyde, petrochemical-derived fragrance, and propylene glycol. At GWE, we create products from mother nature’s finest ingredients and believe that any product that comes into contact with humans should be safe and non-toxic. Anything that causes cancer or allergies has no place in our homes (or stables)!